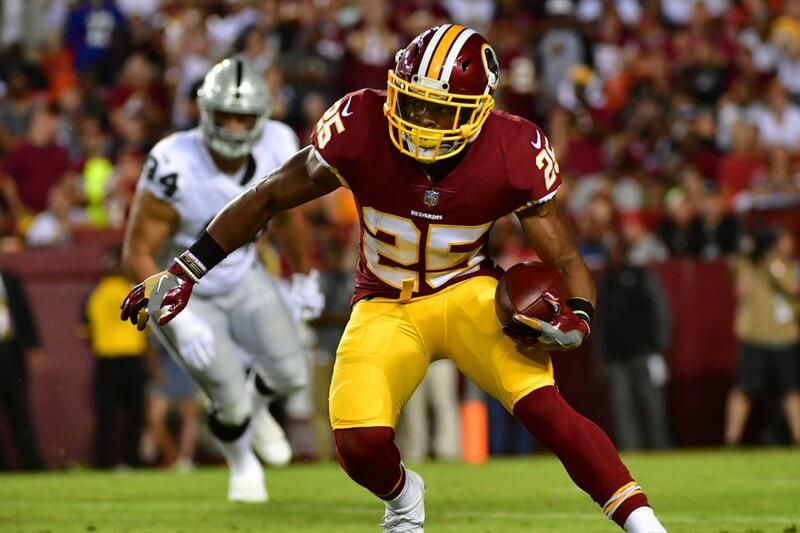 While Adrian Peterson may have stolen the headlines in the Washington Redskins' season-opening win, head coach Jay Gruden said Monday that fellow running back Chris Thompson was a big part of the story. Thompson, after all, sustained a broken fibula on Nov. 19 -- with doctors saying that the complete recovery rate would likely be one full year. The 27-year-old Thompson didn't look sluggish on Sunday, as he posted a team-high six catches for 63 yards in the Redskins' 24-6 romp of the host Arizona Cardinals. "He's been incredible," Gruden said of Thompson. "[His] work ethic to get back to where he was [Sunday] was incredible. ... He did what 'CT' always does. It's a testament to himself as a player and a person to get himself back in shape." "The worries went away, and maybe it was adrenaline or something, but [Sunday] was really the best that I felt ever since my injury, and I was able to go out there and make some plays," Thompson said. The Redskins' ground game looked decidedly better than the team that ranked 28th last year at 90.5 yards per game. "Both have high-ankle sprains and we're waiting on the final results as to whether they will have surgery or not," Gruden said. QB Alex Smith completed 21-of-30 pass attempts for 255 yards with two touchdowns in Sunday's season-opening win. Smith, who targeted six different Redskins at least three times in the game, tossed scoring strikes to tight end Jordan Reed and running back Chris Thompson. TE Jordan Reed found the end zone on Sunday for the first time since scoring twice against the Philadelphia Eagles on Oct. 23. WR Jamison Crowder had three catches for 32 yards on Sunday, leaving him five receptions shy of 200 for his career. WR Paul Richardson moved to within one catch of 100 for his career after catching four balls in the season opener. S Troy Apke sustained a hamstring injury during the fourth quarter of Sunday's game. Coach Jay Gruden did not have an update on his condition.